Buddha was born on December 25th of the virgin Maya, and his birth was attended by a “Star of Announcement,” wise men and angels singing heavenly songs. The earliest biography of Buddha, the Buddhacarita (Acts of the Buddha), was written in the 2nd century A.D., by Asvaghosa. Thus, any and all claims regarding Buddha’s life story already post-date the lifetime of Jesus by at least a century, subverting any claims of influence. However, the Buddhacarita only provides a small amount of confirmation for these claims. It does say that Buddha’s mother was named Maya (after a goddess of the same name), but why this should be relevant is hard to say. Presumably, we are to think that there is some connection between “Maya” and “Mary,” but the name “Mary” was the most popular among Jewish women at the time of Jesus (held by up to a quarter of them), and derives from the Old Testament figure Miriam. In the story of Buddha’s conception, nothing is said of a date of December 25th (which is not found in Christianity with reference to Jesus, until centuries after the Resurrection), or of any angels. Buddha’s birthdate is actually “the 8th day of the 4th lunar month.” The story does mention wise men, but only as advisors who were consulted by Maya’s husband, the king, to interpret what happened to her. Maya’s impregnation occurred when a white elephant entered her womb…hardly a “virgin” conception. 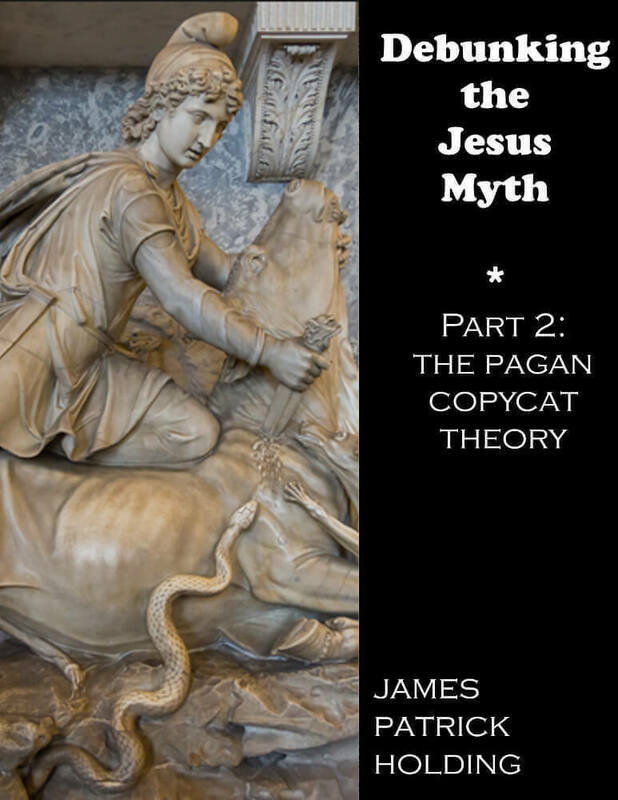 Conceivably, Jerome’s Gymnosophists could have regarded the impregnation of Maya as “virgin” because there was no sexual contact; however, given the lateness of Jerome’s report, it is also likely that the Gymnosophists had been influenced by Christian missions which had by then penetrated considerably into India. In any event, Maya was not a virgin when this impregnation occurred. No evidence can be found in primary Buddhist documents for this assertion, save by association: There was a prediction made at a ceremony for the young Buddha that if he chose a secular life, he would become the universal ruler of the world, but Buddha rejected this path to become a spiritual leader. False. Buddha was prophesied to leave the palace of his father the king and become a holy man, and was kept in seclusion in a vain attempt to avoid this fate. It is when Buddha “escaped” this seclusion that he saw the sights of poverty and suffering that inspired him. Buddha was of royal lineage. This is true, for Buddha was a prince…but it is so very vague and generalized so as to be worthless. Jesus, of course, was descended from King David, but by that time so were tens of thousands of other Jews. Taught in the Temple at age 12. I have found no verification of this claim. The Buddhacarita describes Buddha as a prodigy who was able to learn “sciences” in only a few days that normally took years to learn, but mentions nothing of teaching in a temple. Crushed a serpent’s head (as was traditionally said of Jesus), and was tempted by Mara, the “Evil One,” when fasting. It is true that Buddha was “tempted” by a demon named Mara, who was defeated. Whittaker  adds that Mara was a demon (an “evil one,” but there is no evidence of the words as a title) who tempted Buddha with fear and then with pleasure. Buddha eventually achieved “insight into all his former existences” and came up with the Four Noble Truths. The forms of the temptations were far from being like those Jesus endured: Mara tried to distract Buddha from meditation with an army of demons, whose weapons were turned into flowers. Was baptized in water, with the “Spirit of God” or “Holy Ghost” present. I have found no verification of this claim in primary Buddhist texts. Performed miracles and wonders, healed the sick, fed 500 men from a “small basket of cakes,” and walked on water. I can find no evidence for the “basket of cakes” story, which is the only specific given; however, general miracle-working and healing is a universal of religious traditions, and does not bear any noteworthiness. I also find no story of Buddha walking on water, though there is a story of one of his disciples walking across the surface of a river to see Buddha, and sinking until he renews his faith. This story is obviously compared to that of Peter walking on water to see Jesus, but I can find no evidence that it pre-dates Christian missionary efforts in Buddhist countries. “Abolished idolatry” doesn’t matter in any event; Jesus never had to do this, as the temptation to worship idols had long left Judaism by his time. I can find no verification for the other claims. Followers were obliged to take vows of poverty and to renounce the world. It is true that many of Buddha’s followers lived the lives of ascetics, but vows of poverty and asceticism are characteristics of later, monastic Christianity, not of the Jesus movement. Some Buddhists may in fact draw a parallel between the transfiguration of Jesus, and a radiance that is said to shine forth from Buddha as a signal of his spiritual evolution. However, I can find no specific story of this occurring on a “mount” and Buddha’s “transfiguration” had to do with an inward change available to all men, whereas Jesus was transfigured with the Shekinah glory of God. The word “transfiguration” is used too loosely, and therefore also inaccurately, in such comparisons. In some traditions, died on a cross. I have yet to see any example of such a tradition, much less documentation from primary Buddhist documents or from Buddhist documents pre-dating Christian missionary incursions. Buddha was not entombed, but cremated, and Nirvana is not a place one can “ascend” to but is, rather, a state of being. The only story that comes close to this one comes from a Chinese translation of a document called the Mahamaya Sutra, in which the deceased Buddha briefly opens his coffin to speak, then lays back down and closes the lid. Was called Lord, Master, Light of the World, God of Gods, Father of the World, Almighty and All-knowing Ruler, Redeemer of All, Holy One, the Author of Happiness, Possessor of All, the Omnipotent, the Supreme Being, the Eternal One. Was considered a Sin Bearer, Good Shepherd, the Carpenter, the Infinite and Everlasting, and the Alpha and Omega. Came to fulfill, not to destroy, the law. Obviously this isn’t the Jewish law that Buddha could have fulfilled, so it is hard to see why this should be a parallel, even if it is ever validated from a primary Buddhist source. Is to return “in the latter days” to restore order and to judge the dead. This is not exactly correct. The future Buddha, called Maitreya, will be a different person born into the world. So it is that the bulk of copycat claims about Buddha are just that—claims. It is no surprise that critics never appeal to primary documents. E. H. Johnston, trans. Asvaghosa’s Buddhacarita (Delhi: Motilal Banarsidass, 1984), 8. The wise men were Brahmins, members of the priestly caste. Clio Whittaker, Introduction to Oriental Mythology (Chartwell Books: 1989), 79-80. Johnston, op. cit., 24. An online source, <http://www.mahidol.ac.th/budsir/life_02.htm>, records a tale of Buddha as a prodigy at 15. I cannot vouch for the accuracy of this source, but because it is an academic website associated with a reputable university, I am inclined to give it the benefit of the doubt. Accessed April 29, 2008. Aurel Stein, trans. Kalhana’s Rajatarangini: A Chronicle of the Kings of Kasmir, Translated (Delhi: Motilal Banarsidas, 1979), Volume 2, page 172.